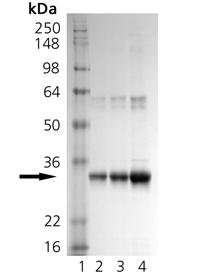 Substrate for farnesyltransferase (>25%) with Km~4 µM using rat brain FT. Possesses GDP binding at >1:4 GDP/H-ras. Formulation: Liquid. In 20mM TRIS-HCl, pH 8.0, containing 45mM sodium chloride, 1mM DTT, 5mM magnesium chloride and 50% glycerol. SDS-PAGE Analysis: Lane 1: MW Marker, Lane 2: 1 μg, Lane 3: 2 μg, Lane 4: 5 μg Ras.